I often say that “it” is always about the little things. The “it” can be a relationship, an experience traveling, or of course restaurants and brunch. You could go to a cafe where the server did something extra thoughtful for your table, you could find yourself loving extra the large mugs at a restaurant, or a unique garnish added in a bloody Mary. 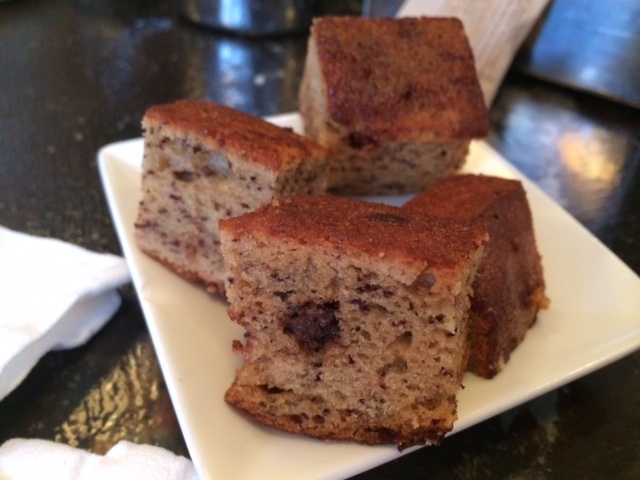 Today at Tremont I was surprised when an amuse bouche arrived at our table– Tremont had assembled small bites of banana chocolate chip bread on a plate. It was an awesome couple of bites to start off our brunch experience. And we weren’t the only ones provided with this treat. Every table Tremont serves receives the plate off the bat when they sit down. While I had been to Tremont in the past, this special touch wasn’t incorporated into their service yet. I think it is a great little touch that makes a big difference. Thank you and Bravo team Tremont! Wishing you a healthy and happy 2014. May your mimosas be bubbly, your conversation lively, and your year sunny-side up.